Horizontal Black and White. Have you seen these horizontal stripes in any of the Designer Series papers? Here’s a hint – they look a lot like the diagonal stripes in Kaleidoscope Designer Series Paper. 🙂 In the design in my mind, I used bold, horizontal stripes, so I cut into the diagonal paper, cropping along the lines to “flatten” these stripes. Woo hoo! My hands achieved what my mind perceived. Reinventing the Sketch. So, the sketch appears to have three banners or three bands on the right side. I’ve made several cards with banners that originate from the left or right side, so I wanted to do something different. I decided to crop strips of paper that are the exact same width of the stripes in the paper and then simply lay them down over top of the stripes, creating different colors in the same pattern. Balancing Color. What coordinates well with black and white? Almost anything. I instinctively reached for Coastal Cabana, a bright and cheery offset to the muted black and white. Real Red is a perfect accent to Coastal Cabana, so I carefully added two pops of red. While a thin, red border frames the center of this card, your eye is instantly drawn to the bright red banner that houses my sentiment. 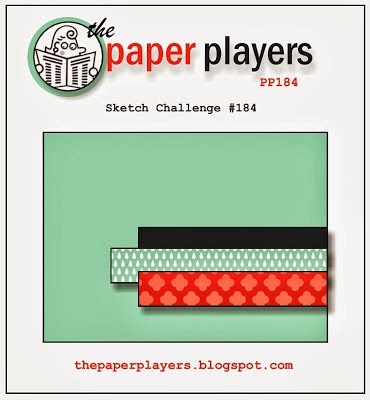 Please go to The Paper Players to see the cards by the Design Team Members. Your choice of $25 in product. All you need to do is buy from me and track your purchases – oh! and pick free items you want. My shopping rewards are available all year-long – read more about them here. You asked. I listened. Tomorrow, I’m sharing a video tutorial I filmed over the weekend. Lots of people own a Stamp-a-ma-jig, but I’ve heard that not everyone knows how to use it. Brian to the rescue! Your card is simply, perfectly, literally, thee Perfect Blend!!! 🙂 Brian, your observation about your hands achieving what your mind was perceiving is brilliant, and so are you!!! 🙂 Flawless execution!!! I am inspired and off to achieve my perfect blend (of iced coffee) on this Monday morning!! 😉 TFS!!!!! Love your blog. Love your cards. Love the interview in Stampin Success!!! The Coastal Cabana stripes really adds that extra pop to the card. Isn’t it great when everything works out the way you planned. Great card to start the week off. It’s always amazing for me to see the fantastic results of your mind at work, Brian. To visualize a design and then, find a way to make it happen is truly sensational. Then, you went a step forward by adding that delicious splash of color to the black white stripes and to the sentiment. Love it!!!!! A very good way to start the week …with boldness ! Neat card ! Looking forward to the SAMJ info and tips . I just pulled mine out and started using it again after a couple of years . Yay Brian ! Oh good. As you mentioned, lots of people have them, but don’t really know ho to use them well. I’m starting to care more about whether my stamps are straight, so – good timing! Thanks! You are on a roll. Fabulous card!!!! I have been using the Stamp-A-Ma-Jig for years and it sits on my desk within hands reach all the time. Actually I think I would be lost without it. Once you start using it and see everything exactly where you want it – you are hooked and wonder how you ever did without it before! When I meet a stamping “newbie” I always suggest getting one as essential. Your card, dear young man, is fabulous – as always! I love the abstract look of your card!! Great job ! And you are so right about how super simple sketch can be just as difficult as a complicated sketch!! Love all these colors together, Brian! And, the design couldn’t be any better…how fun! Great coffee cup and sentiment, too! Wow…another one of my favs…so modern, fresh, and fun…great job! I love this card, Brian! So unexpected, yet makes so much sense! I finally got to read your article in Stampin’ Success and YAY for YOU!! Wonderful job – you deserve all the accolades you have been getting. Happy for you. What an ingenious use of these elements, Brian. Super card! I LOVE how you added the Cabana to break up the black strips, AWESOME!!!! What a striking card! I do love the Perfect Blend coffee cup! So glad I bought the set … it is just fun both if you love coffee and/or have special friends and family who do, too! Wow!! I love your Card!! Your so right on the punch of the red!! I love it! I also participated in this swap, but I am thinking your design is AH-MAZING!! Have a great day Brian! Fun, Brian! Love the bold look to your coffee card….and now I am hankering a cuppa decaf! Thanks for playing with the Players this week!